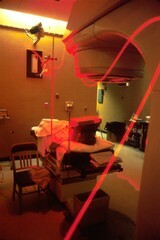 Seen is a "beam of light" traveling along fiber optics for photodynamic therapy for use in an operating room. Its source is a laser beam which is split at two different stages to create the proper "therapeutic wavelength". The patient has been given a photo sensitive drug containing cancer killing substances which are absorbed by cancer cells. During the surgery, the light beam is positioned at the tumor site, which then activates the drug that kills the cancer cells, thus photodynamic therapy.